Danze Melrose Modern Chrome Pull-Out Kitchen Faucet with Soap Dispenser: This Danze Melrose Pull-Out Kitchen Sink Faucet is built to last. The highest quality standards are used to precision manufacturer a top of the line fixture. Important features of this 100% BRAND NEW Fixture: Complete Item! Everything necessary for installation is included. 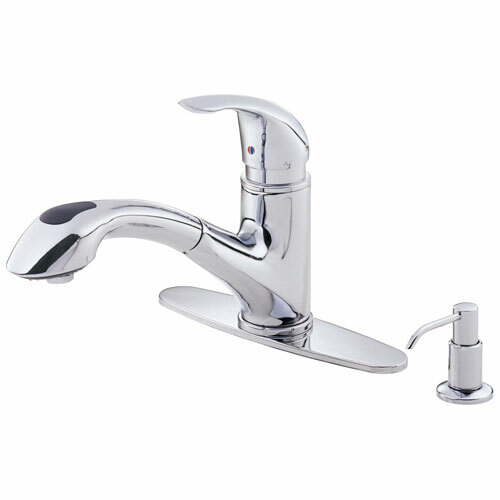 Chrome Kitchen Faucet with Soap Dispenser - Single Handle Kit Melrose Collection Pull Out Spout - There's no denying the attraction of the Melrose single handle pull-out kitchen faucet. Its proven design and easy-going beauty appeals to a wide array of homeowners. You can bet it's built to meet the high standards we set for Danze products with premium components and a limited lifetime warranty. - Chrome finish gives your kitchen a bright, shiny look - Single handle lever design for quick and easy water control - Chrome premier finish designed to resist fading and tarnishing. - Ceramic disc valve will provide smooth water flow - 2 functions spray/aerated stream for easy cleanup of pots and pans - Includes matching brass soap/lotion dispenser - ADA compliant for universal use - Swivel Spout, Perfect for Large or Double Bowl Sinks! - Single Handle Faucet - Matching Accessories Available - Easy to Install - Installation instructions included. This fixture is manufactured by Danze and is part of their Melrose Collection. There's no denying the attraction of the Melrose single handle pull-out kitchen faucet. Its proven design and easy-going beauty appeals to a wide array of homeowners. You can bet it's built to meet the high standards we set for Danze products with premium components and a limited lifetime warranty.